Immigration, law enforcement, gun control, and Judge Brett Kavanaugh were just a few of the issues that U.S. Sen. Ted Cruz and U.S. Rep. Beto O’Rourke addressed in their first debate Friday at SMU. In what has become a down-to-the-wire race for the U.S. senate seat – a position that has been held by a Republican since 1993 – Friday’s debate saw Cruz and O’Rourke clash in person for the first time. On the issue of the allegation against Kavanaugh that he sexually assaulted a woman when they were teenagers, Cruz was asked if there was “anything [accuser] Christine Blasey Ford could say” that might lead him to oppose Kavanaugh. Cruz replied, “absolutely,” but would not offer specifics. O’Rourke, on the other hand, called for Blasey-Ford to be heard. Cruz deflected a question asking about his relationship with President Donald Trump, who was critical of Cruz during the presidential election of 2016. Instead, Cruz said he “loved his wife very much” – a callback to when Trump insulted Cruz’s wife, Heidi, on Twitter. O’Rourke mentioned several times how he has visited every district in Texas, while Cruz reminded those in attendance that he was “on the ground” in cities like Houston and Victoria following Hurricane Harvey. Neither candidate used the debate to brag much about their accolades, but both seemed very proud about the aforementioned facts. O’Rourke grew more comfortable as the debate progressed; at the beginning, he struggled to make eye contact with the crowd and appeared to stammer. As the final questions came, however, he seemed more at peace with his answers, and had no problem “exchanging blows” with Cruz – the more experienced debater of the two. The crowd at SMU seemed evenly split – there were plenty of people in support of Cruz, as evidenced by their polite applause following many of his points. O’Rourke’s supporters, many sporting “Beto for Senate” shirts, were quite vocal – especially when the debate ended, when a large portion stood and cheered. 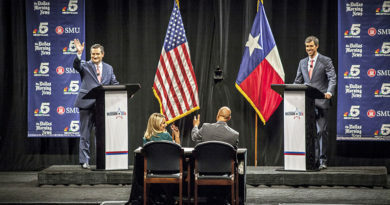 Two more one-hour debates, as agreed upon by O’Rourke and Cruz, are scheduled: one on Sept. 30 at the University of Houston, and the final on Oct. 16 at a studio in San Antonio.